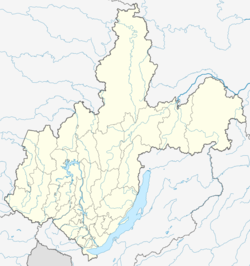 Ust-Ilimsk (Russian: Усть-Илимск, IPA: [usʲtʲ ɪˈlʲimsk]) is a town in Irkutsk Oblast, Russia, located on the Angara River. Population: 86,610 (2010 Census); 100,592 (2002 Census); 109,280 (1989 Census); 53,000 (1977). An ostrog (fortress) was built on the present site of the town in the 17th century; however, the modern town was not founded until 1966, during the construction of the Ust-Ilimsk Hydroelectric Power Station, which backs up both the Angara and the Ilim Rivers, and, incidentally, flooded the old town of Ilimsk, which was located further up the Ilim. The region was the site of one of the most notorious gulags of the 1930s; tens of thousands died in the camp. 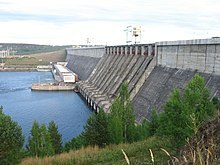 Town status was granted to it in 1973; the dam was completed in 1980. Within the framework of administrative divisions, Ust-Ilimsk serves as the administrative center of Ust-Ilimsky District, even though it is not a part of it. As an administrative division, it is incorporated separately as the Town of Ust-Ilimsk—an administrative unit with the status equal to that of the districts. As a municipal division, the Town of Ust-Ilimsk is incorporated as Ust-Ilimsk Urban Okrug. Ust-Ilimsk has a subarctic climate (Köppen Dfc) with warm, humid summers and severely cold, drier winters. The monthly 24-hour average temperature ranges from −23.1 °C (−9.6 °F) in January to 17.7 °C (63.9 °F). Precipitation is moderate and is somewhat higher in summer than at other times of the year. Sunshine is generous and the area receives 2,011 hours of bright sunshine annually. Alongside the hydroelectric plant, a thermal power plant, sawmills and industries such as food production are employers in the town. A 214-kilometer (133 mi) branch railway connects Ust-Ilimsk to Khrebetovka on the Baikal-Amur Mainline. The town is also connected by road to Bratsk. Ust-Ilimsk has a tram line, constructed by a local timber company to connect the city center with a nearby sawmill. Construction of the tramway began in 1982, with its opening in 1985. The line was later extended to a total length of 18 kilometers (11 mi). Traffic is coordinated to coincide with shift change times at the mill, as well as hourly runs outside these times. There are plans to extend the line to a new mill to the north of the town, as well as to the city railway station. The Ust-Ilimsk Airport was closed in 2001. Lesokhimik is a professional bandy club which played in the highest division of the Russian Bandy League between 2004 and 2008. Законодательное Собрание Иркутской области. Закон №65-оз от 2 декабря 2004 г. «О статусе и границах муниципального образования "город Усть-Илимск" Иркутской области», в ред. Закона №72-ОЗ от 7 ноября 2017 г. «О распространении действия отдельных законов Иркутской области на всю территорию нового субъекта Российской Федерации — Иркутской области и внесении изменений в отдельные законы Иркутской области». Вступил в силу с 31 декабря 2004 г., но не ранее чем через 10 дней со дня официального опубликования. Опубликован: "Восточно-Сибирская правда", №244–245, 9 декабря 2004 г. (Legislative Assembly of Irkutsk Oblast. Law #65-oz of December 2, 2004 On the Status and Borders of the Municipal Formation of the "Town of Ust-Ilimsk" of Irkutsk Oblast, as amended by the Law #72-OZ of November 7, 2017 On Expanding the Scope of Several Laws of Irkutsk Oblast to the Whole Territory of the New Federal Subject of the Russian Federation—Irkutsk Oblast—and on Amending Various Laws of Irkutsk Oblast. Effective as of December 31, 2004, but not earlier than 10 days after the official publication date.). Законодательное Собрание Иркутской области. Закон №97-оз от 16 декабря 2004 г. «О статусе и границах муниципальных образований Усть-Илимского района Иркутской области», в ред. Закона №125-ОЗ от 26 декабря 2016 г. «Об упразднении Кеульского муниципального образования, образованного на территории Усть-Илимского района Иркутской области, распространении действия Закона Иркутской области "О статусе и границах муниципальных образований Усть-Илимского района Иркутской области" на всю территорию нового субъекта Российской Федерации — Иркутской области и внесении в него изменений». Вступил в силу с 31 декабря 2004 г., но не ранее чем через десять дней со дня официального опубликования. Опубликован: "Восточно-Сибирская правда", №254–255, 20 декабря 2004 г. (Legislative Assembly of Irkutsk Oblast. Law #97-oz of December 16, 2004 On the Status and Borders of the Municipal Formations of Ust-Ilimsky District of Irkutsk Oblast, as amended by the Law #125-OZ of December 26, 2016 On Abolishing Keulskoye Municipal Formation, Established on the Territory of Ust-Ilimsky District of Irkutsk Oblast, on Expanding the Scope of the Law of Irkutsk Oblast "On the Status and Borders of the Municipal Formations of Ust-Ilimsky District of Irkutsk Oblast" to the Whole Territory of the New Federal Subject of the Russian Federation—Irkutsk Oblast—and on Amending It. Effective as of December 31, 2004, but not earlier than ten days after the official publication date.). This page was last edited on 2 September 2017, at 19:53 (UTC).